It's that time again - football season is underway! (Let's go Buffalo!) But before you break out the game day snacks take a second to think about it. A football game is typically 3-3.5 hours long. That is plenty of time for you to stare at the TV while mindlessly eating. Before you know it you have consumed 3,000 calories of snacks in one sitting. This may be okay for those NFL players you're watching, but not for you. Here are some tips to help keep the calories away to ensure you don't end up the size of a linebacker. 1. Cut the calories in your dips- Instead of using sour cream or mayonnaise as a base try Greek yogurt or fat-free sour cream. Add your traditional dry seasoning mix to these and your guests will never know the difference. Touchdown! You just saved your buddies a lot of calories. 2. Pile up the veggies- This can be done a couple different ways. a. Use vegetable for dips instead of chips and crackers and save a lot of calories. One cracker has about 15-20 calories, a WHOLE pepper has 25. A lot more bang for your buck. 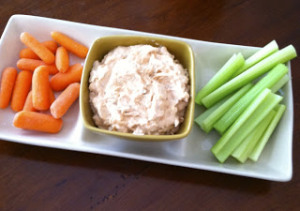 Raw carrots, cucumbers, celery, bell peppers, cauliflower, and cherry tomatoes make colorful and crunchy companions to any dip (celery with chicken wing dip, yum!). In pasta dishes- Cut the amount of pasta in half and replace it with vegetables. It can be any vegetables you want. This works in pasta salads and hot pasta dishes. Chili- Try a vegetarian chili. But, if this goes against your game day tradition use your recipe and keep the meat but add extra veggies and beans. I included a recipe for all you skeptics. Veggie burgers- These have come a long way from the dry hockey pucks they once were. Black bean burgers are packed with protein and spicy flavor. No, it won't taste exactly like a hamburger but it makes a great sandwich and will save you 10 grams of fat and about 100 calories. 3. Watch the condiments- Condiments and toppings add up. Use tomatoes, onions, and peppers for flavor and try using guacamole or spicy mustards instead of ketchup, honey mustard, mayo, and cheese. a. Chicken/meats- yep, chicken wings and meatballs. Instead of deep frying these dishes, try baking them. Deep frying foods double the fat and calories by absorbing extra oil. The same goes for pan frying. Baking them may take a little longer but you just blocked the extra points from calories and fat for the win. Baking meats is also a good alternative for when it's too cold out for grilling (never too cold us in Buffalo). b. Baked chips- If you must have chips for your dips choose the baked options. Baked tortilla and potato chips will save you a few calories and grams of fat (but not as many as using vegetables in dips!). 5. Substitute lean meats- If a veggie burger isn't for you, try a chicken or turkey burger. Meats like chicken, turkey and fish are leaner and lighter in calories. Ground turkey makes a great substitution in chili and grilled chicken sandwiches can be just as tasty as a cheeseburger. 6. Eat from a plate- Grazing from the snack table is not ideal portion control. Grab your plate head for the end zone. This way you aren't temped to stand by the snacks all day. If you really want to get serious, pop in a stick of gum or a mint after you finish your plate. 7. Limit the Alcohol- Alcohol is packed with calories. So limit the game day brews to lighter beers. A 12 oz. Regular beer has about 150-200 calories where light beer has around 100. Not to mention, alcohol consumption leads to hunger. 8. Watch your temperatures- Tailgating or having a buffet out for more than 2 hours puts foods into the 'temperature danger zone' (40-140F) where bacteria that causes food borne illnesses grows best. Never break out the leftovers after the game while you're waiting for the parking lot to clear. Keep coolers stocked with plenty of ice and throw out foods that have been out for too long. This goes for buffet/snack tables at home too. 2. Add chipotles, oregano, cumin, chili powder and salt. Stir to blend. 3. Add tomatoes and 4 cups water. Gently simmer over low heat, uncovered, for 45 minutes. Add beans and simmer an additional 30 minutes. 4. Garnish individual bowls with green onions or sharp cheddar cheese (adds calories) if desired. ** may not be suitable for those with a sodium restriction, cut out salt in recipe for 800mg sodium per serving. This recipe is just a guideline - if you make it and decide you like black beans better than kidney beans, take them off the field and put the black beans in. If you don't like cooked celery, you won't get tackled if you don't put it in! Just like your team, practice before the big game to make it a winner.